Heartworm Resistance: Fact or Fiction? What do you know about Brucella canis? What is the Best Age to Spay or Neuter Canine Patients? I need to recommend WHAT to my small mammal clients? Veterinary Anesthesia-Free Dentistry: What's the Big Deal? Veterinarians and Vet Students: What can you do to help in times of natural disasters? The Night Shift: A Health Hazard for Veterinarians? Imposter Syndrome - Most Veterinarians Suffer From It. Now What? So what EXACTLY is the Dress Code in a Veterinary Setting? Make your Veterinary Externships Count! What's the Ideal Number of Daily Appointments for Veterinarians? Increasing Social Media Reach For Your Vet Practice! Recalls: Euthanasia Drug in Pet Foods? STOP using Tramadol in Dogs? 5 Veterinary Blogs for Vets That You Must Read This Year! Don't Blow It! 9 Things to Do the Night Before the NAVLE! Going Back in Time: Things I'd Tell the "Former Veterinary Student Me"
VIDEO: Vet Student, Don't Forget to do This!!! VIDEO: How Do We Pick a Veterinary Internship? VIDEO: Should You Study for the Boards in the Summer? Congratulations Veterinarian Class of 2017! Veterinarian Infographic: 2017 New Year Resolutions? 'Uber For Veterinarians' Coming To Portland? ViralVet Case of the Week: VAC for Degloving Injury, with Video! Veterinarian Infographic: What is a Salter Harris Fracture? Veterinarian Student: Cows Have Claws! November/December 2016 NAVLE® Testers: Do you think you passed the NAVLE? Veterinary Class of 2017, Enjoy the Home Stretch! What Gifts Will You Give Your Cat(s) During The Holidays? Is Second-Hand Smoke Harmful to Pets? You Betcha! Tempted to share your Thanksgiving Feast with your Dogs? 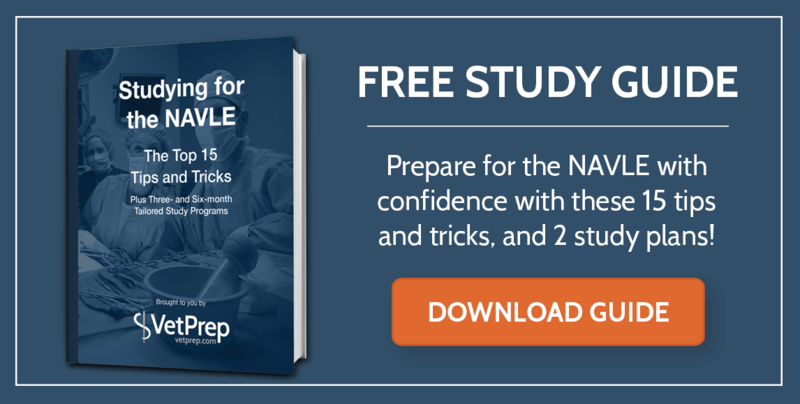 The NAVLE® is here... Good Luck, Vet Student! LINK: Is this two-faced-calf really "Lucky"? Fact: Chinchillas can live 15-20 years in captivity! LINK: Retirement Home for Aging Dogs? It's Real. LINK: Will DNA Testing save a Death Row Dog? NAVLE Pep-Talk, You've Got This! Poll: Will you Dress your Pets up in a Costume for Halloween? Poll: Veterinary Student and Professionals, Have You Contemplated Suicide? Poll: How is your NAVLE Preparation Going? Link: When in Texas, Beware of the Wiener! Poll: Which of these Canine Cartoon Characters is your favorite? Poll: Are your CATS current on their Rabies vaccinations? Do YOU Want to be a VetPrep Student Rep? Is there a Middle Ground between Gold-Standard Care and Euthanasia in Veterinary Medicine? Link: 3d Printing Helps Turtle Walk! Did You Know THIS about the Term Neuter? Do Our Pets Really Need All Those Vaccines? Poll: Are Vaccine Clinics Hurting Quality Veterinary Care? Link: Synthetic Canine Cadavers for All! DVM, are you unhappy at work? May be more than just a bad day. Quiz: Parasite Ova, Can you Identify these eggs? VetPrep users, Have you heard about the Pile of Done? Poll: Where are your Dogs when you go on Vacation? LaMancha Goat Ears: Genetic NOT Surgically Altered! ViralVet Case of the Week: Oh Deer! POLL: Which Oral Flea Prevention Do You Prefer? In the War Against Student Debt, Vet Students are Not Alone! Vet School, Would You Do It Again? Why so many are saying NO! Does Anger Destroy the Human-Animal Bond? Quick Quiz: Test your Veterinary Drug Knowledge! Link: Ready to sign an employment contract? Remove your compensation blinders. POLL: Vet School - Would You Do It Again? POLL: What Veterinary Job Duty do you Despise? Link: Are Veterinarians Legally Required to Report Animal Cruelty? Quick Quiz: Veterinary Spelling Challenge! Have You Seen What's New With VetPrep?! Robotic CT Scanner for Horses? Penn Vet did it! Canine Vaccine Fact: Are DHPP and DA2PP vaccines the same thing? Link: Public Potties for Pets? It's Real. POLL: How often do you really give your pet heartworm prevention? Mini Horse with Prosthetic Hoof? Yep! Don't be Fooled, Vet Student! Are you poisoning your pet, Vet Student? VET STUDENT ALERT: The NAVLE is Coming! Vet Student: Are you ready to be a public figure? Veterinary Medicine: Can a Woman-Dominated Profession Survive? The Top 5 Veterinary Stories of 2015! The 2015 Nov/Dec NAVLE Window is Here! Dogs Can Help with Asthma Prevention? Increasing Feline Examinations in Practice? Drug Update: What's going on with Ketamine? Looking Back at Veterinary Medicine 40 Years Ago. What will they ask me on the NAVLE? Why Does Bovine Viral Diarrhea Virus (BVDV) Receive So Much Attention?